Discovery Passes– Passes distributed through youth and adult social service community organizations in Central Oregon. Contact Erica Pelley at 541-382-4754 ext. 320 for more information on either becoming part of the Discovery Pass Program or for those that are already pass holders to register for a Museum visit. Desert Explorer Pass – Family passes that can be checked out from local libraries. Museum & Me is a time for children and adults in our community with disabilities to enjoy the High Desert Museum during its quietest hours. Explore the Museum’s newest exhibits and revisit your favorites free of charge. Adult chaperones are required and friends are welcome. This is a quarterly program. Blue Star Museum– Active duty military, National Guard and Reserve military personnel and their families may visit at no charge from Memorial Day through Labor Day. Little Wonders – A partnership with NeighborImpact, providing free annual membership to Head Start kids and their families in our community. Kids Curate – Our staff works for a full year with elementary school children in schools where arts funding has been cut to create and curate an art exhibition that will be on display at the Museum. 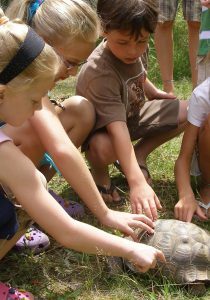 Animal Adventures– A free program where our staff takes wildlife to libraries in Crook, Deschutes and Jefferson counties and introduces early learners to various critters. Museums for All -Families may visit the High Desert Museum at a reduced admission rate of $2.00 per person with the presentation of an Electronic Benefits Transfer (EBT) card and photo ID. The reduced rate will be offered for up to six individuals (up to two adults and four children) per EBT card and is valid during normal business hours only. Military Discounts – Active and retired military personnel with government ID receive 10% off their family’s admission. For more information on these access initiatives, contact the Museum at 541-382-4754 ext. 241 or contact us.